Davaoeños kicked off the festivities with a parade of creative Torotot-inspired costumes that livened up the streets around People’s Park leading to Roxas Boulevard. On the other hand, a Torotot featuring an intricate durian wood carving bested other stunning entries in the search for the most creative piece, showcasing the undeniable artistry of Davaoeños. Loyal and new Smart subscribers at the festival enjoyed the Torotot Festival like no other as they got the chance to win exciting raffle prizes at the Torotot Festival countdown show as well as Smart Prepaid activity booths. The New Year countdown program started in the afternoon with a grand hiphop dance battle among Davao City's barangays. In the end, Sta. Ana Move Struck earned the top prize with their jaw-dropping moves. Hours before the much awaited countdown, the iconic Pinoy band “Color it Red” and renowned vocalist Luke Mejares dished out popular Pinoy songs that got the crowd singing along. 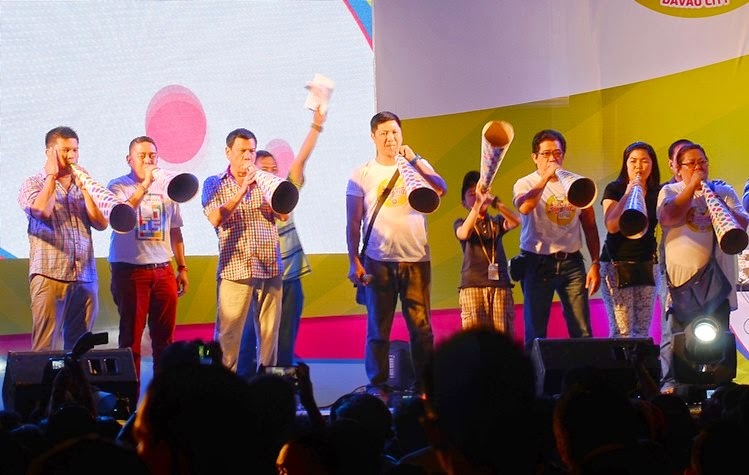 But the cheers and shrieks of the crowd were the loudest when Davao Mayor Rodrigo Duterte addressed the crowd and thanked everyone, including Smart, for supporting the city's advocacy in creating a safe, peaceful New Year celebration. With so much enthusiasm, thousands simultaneously blew their colorful torotots at the final moments of 2014, embracing the New Year with optimism and hope. Throughout the celebration, everyone enjoyed snapping, posting and sharing the most awesome moments with family and friends here and abroad on the strength of Smart’s network, and its 30 MB worth of free mobile Internet to all subscribers. As a fitting welcome to the New Year, Department of Tourism (DOT) Asst. Sec for Region 11 Arturo Bongcato unveiled its new campaign, "Visit the Philippines 2015." Bongcato highlighted Davao City's important role in this news campaign as it continues to draw a growing number of local and foreign tourists every year for its natural wonders, rich culture and joyful festivals. To stay updated with Smart events and promos, simply follow Smart’s official accounts on Facebook (www.facebook.com/SmartCommunications) and Twitter (@SMARTcares).